Connecting The Dots — Thursday we were hearing shock from a number of Democrat lawyers at the decision by Judge Andrew Guidi to reverse the election results in House District 40 and declare Democrat-but-Republican Majority member Rep. Ben Nageak the winner. 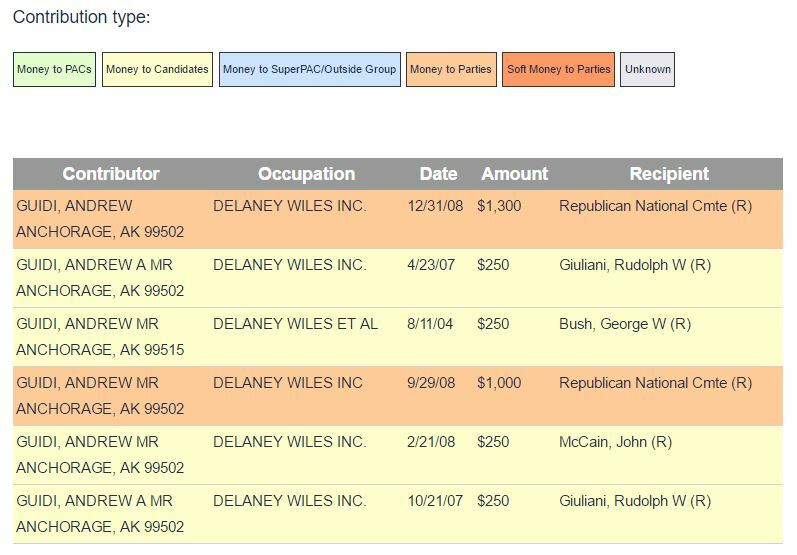 A large part of that shock appeared predicated on footnote 82 of the decision which says Judge Guidi found former Republican Party Chairman Randy Ruedrich a more trustworthy source than successful progressive campaign manager John-Henry Heckendorn. Well, that certainly explains things. It’s Over — We have offered our opinion over the last few weeks that the combination of Sen. Bill Wielechowski out flanking the entire Alaska Republican establishment on the PFD and his endorsement by the NRA makes him all but unbeatable in his re-election bid this year. 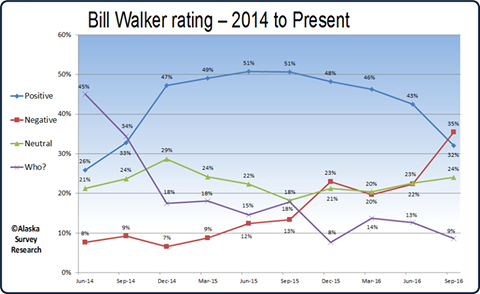 The poll was conducted from September 26-28. More NRA Drama — Speaking of NRA endorsement drama, Wasilla Republican house candidate, and NRA member since 2004, Colleen Sullivan-Leonard was none too happy to see her Democrat opponent Sherie Olson get the powerful group’s endorsement. After Sullivan-Leonard called them to see why she never received a candidate questionnaire, the NRA sent her one last week. Score One For Lora — Among the many fundraisers that took place last night was one for Rep. Lora Reinbold. 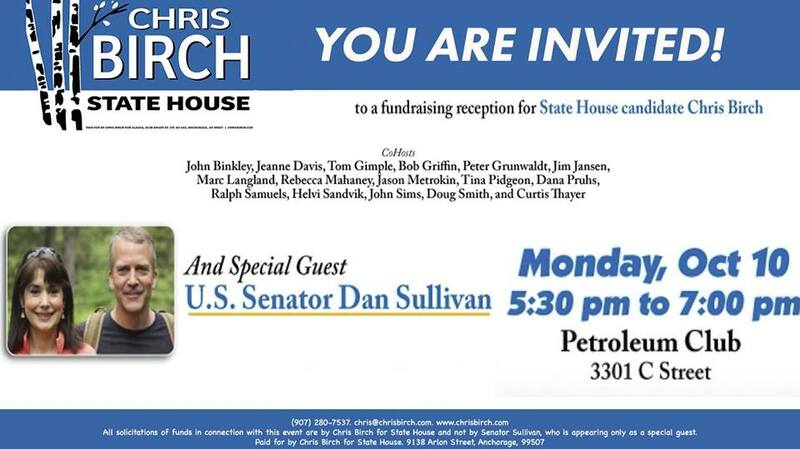 Among the listed sponsors for the event are Rep. Dan Saddler and Sen. Anna MacKinnon. That is interesting considering both Saddler and Mackinnon endorsed and featured prominently in ads for Reinbold’s primary challenger Crystal Kennedy. Prior to the election, we were hearing a lot of insiders eagerly rooting for Reinbold’s ouster. It would appear the realities of legislative organization have allowed Reinbold to force the establishment to come to her rather than the other way around. Republican Freshman Conclave — Word is a private meeting is being organized at Jennifer Johnston’s house two weeks from now for likely Republican freshman legislators. We hear former Speaker Gail Phillips and former Majority Leader Ralph Samuels will be in attendance. Some think the two legislative vets are being brought in to help the GOP freshmen get on the same page about organization. We aren’t sold on that as both Phillips and Samuels are pretty shrewd in their dealings with legislators and getting in the middle of organizational drama can get pretty ugly. It is more likely they will give the newbies advice of what to expect as new legislators. 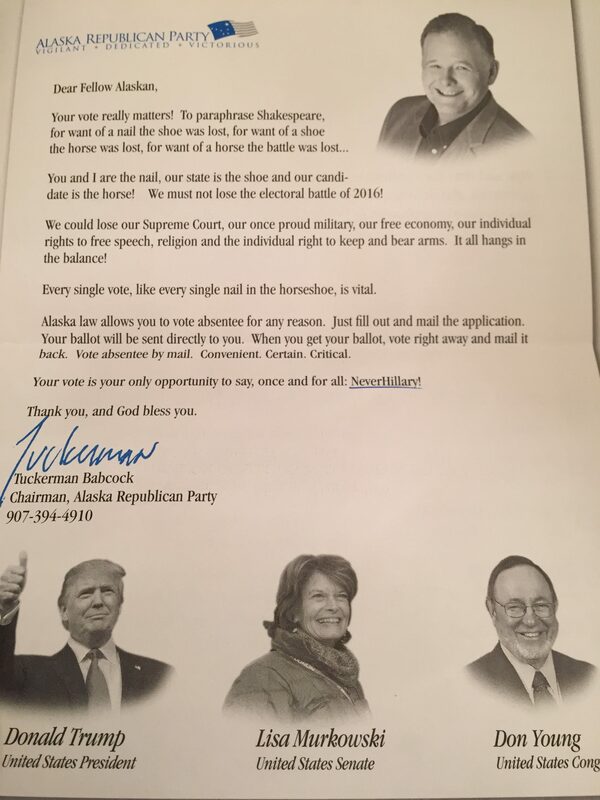 On a side note, how thrilled do you think Sen. Lisa Murkowski is to have her picture right there with Donald Trump’s? 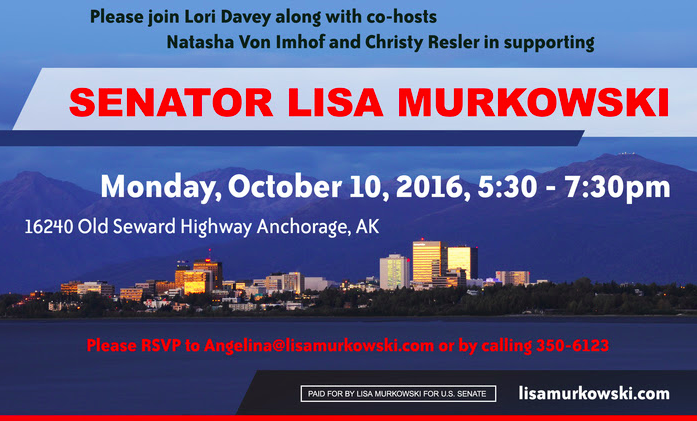 Given what we know about Murkowski, we are guessing not much. PFD Battle — Alaska Republicans continue to struggle to find a foothold in the battle over PFD funding after getting outflanked on both sides. Gov. Bill Walker securely holds the adult in the room “using PFD money to fill the budget shortfall is the responsible thing to do” position and with his lawsuit against the Governor, Sen. Bill Wielechowski owns the “I’m going to keep the government’s hands off your PFD” position. Republicans continue to flail somewhere in between. In what is likely the kick-off to a run for Governor in two years, Sen. Mike Dunleavy held a press conference yesterday in front of the Fred Meyers on Muldoon to announce he will introduce a bill to restore the amount of the PFD after-the-fact. “I have been working with my senator, Mike Dunleavy, on what we will be calling “The 2016 PFD Restoration Act”. It looks like the bill will at least be introduced in both legislative bodies. Anyone want to give odds on it getting to the floor or passing? 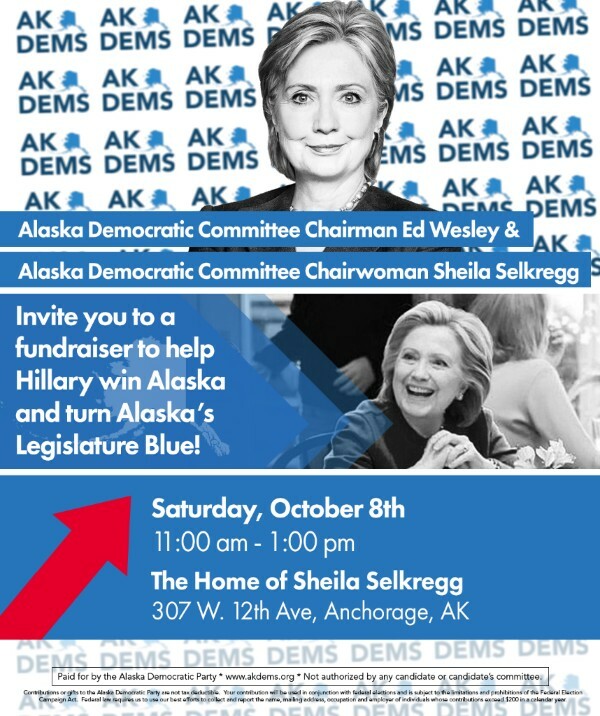 Governor, let us introduce you to the third rail of Alaska politics. Money, Money, Money… Money! — This is the last day to donate to state candidates before they have to file their 30-day APOC reports, so if any of them have your email address you will probably be inundated with emails begging for last minute cash so their reports can look as impressive as possible. According to our sources, one candidate’s report is already looking pretty impressive. We hear Vince Beltrami is closing in on $90K raised just since the primary election. People smarter than us say that is a record for money raised in that period. His opponent, Sen. Cathy Giessel is no fundraising slouch, so we are guessing she will do pretty well in the same period as well. One Last Thing — Here is a new attack ad on Rep. Lance Pruitt that will begin running today. Be the first to comment on "Friday in the Sun!!! (October 7)"